Bear Creek BC T80 Molly, Born 01/05/2005, placed 6 th out of 94 in her class, at the ABGA Nationals in Louisville, Kentuck, June 2005. 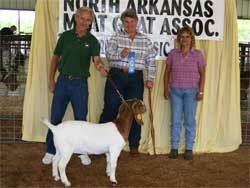 Bear Creek BC S59, Born 07/31/04 took First Place under Jackie Edwards at the Northwest Arkansas Meat Goat Association Spring Classic in Harrison, Arkansas, May of 2005. Bear Creek BC D780 Ms Energizer Bunny. Picture taken 28 Jan 2015. One of our keeper Doe's!! She will be bred July 2015. Just sharing a picture of some of our 10 month old kids. Picture taken 10 Nov 2016. These are NOT for sale, BUT, we will be offering kids that were born in Dec 2016 around early April 2017 that should grow out just as nice. We will also be offering some of their Dam's, still needing to cut our numbers. Kids offered in April will be out of Bear Creek BC D817 Argo; Bear Creek BC D827 Gator's Dundee and Bear Creek BC C746 Rainmaker's Thunder. Most will be priced $850.00. The older Doe's will be priced around $500.00 - $850.00. We will be offering 3 wethers for $350.00 each. You can also choose from some of our bucks that will NOT be disbudded for $500.00 - $650.00. Annie is another one of our keeper Doe's, she placed 3rd out of 9 at the Show Me Spring Spectacular Show 2 in Sedalia, MO April 2010. Look for her kids in January 2012. Holly has been a great Show Doe, recently placed 4th right behind White Diamond at the Ozark Empire Fair in Springfield, MO on 3 August 2010. She is destined to be bred by TLB 9004. Picture taken 22 Aug 2010. Mikayla, has been a great show doe as a Junior and now a Yearling. She was bred 26 Oct 2012 to Jester AABG Steam Roller. We are expecting great kids!! Picture was taken 10 Oct 2012 at the Goat Expo in Des Moines, IA. Steam's Top Secret has been one of our 2012 show doe's. Seems to always place 2nd or 3rd, but in some big classes and tough competition. 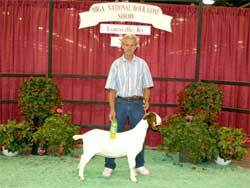 This picture was at the Goat Expo in Des Moines IA. Just sharing a picture of some Doelings that are just now turning into Yearlings. They were born 05 Jan thru 17 Jan 2010. They are out of Bear Creek BC W213 Joshua, TLB 9004 and TLB 8055. We will be breeding them in Jul/Aug for 2012 Kids. Just sharing a picture of some of our Doe's enjoying a Early April Day. 04/13/2011.